The Call of the Wild Mural is a traveling collaborative public art Installation advocating for wolves and the Endangered Species Act. Plan B to Save Wolves and I AM WOLF NATION™ are sponsoring the Call of the Wild Mural in support of wolves and all endangered species. 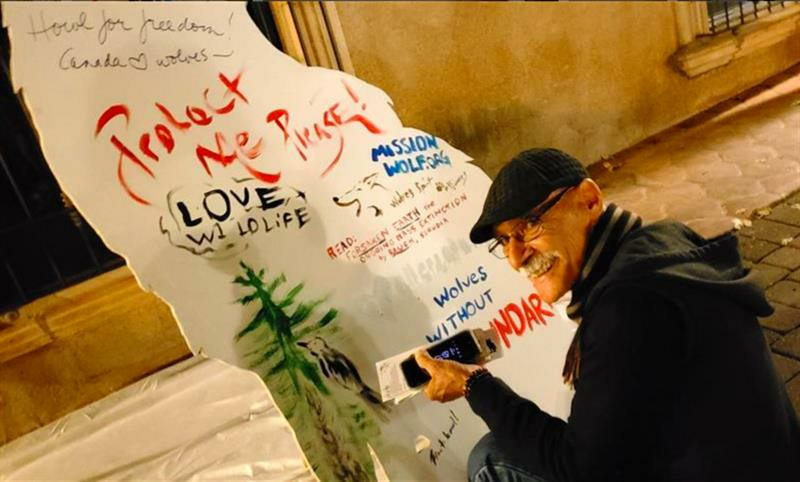 The official launch of the Call of the Wild Mural took place at Plan B to Save Wolves and I AM WOLF NATION™’s 1st Annual Call of the Wild Benefit on October 25th at Tlaquepaque Arts & Crafts Village in Sedona. 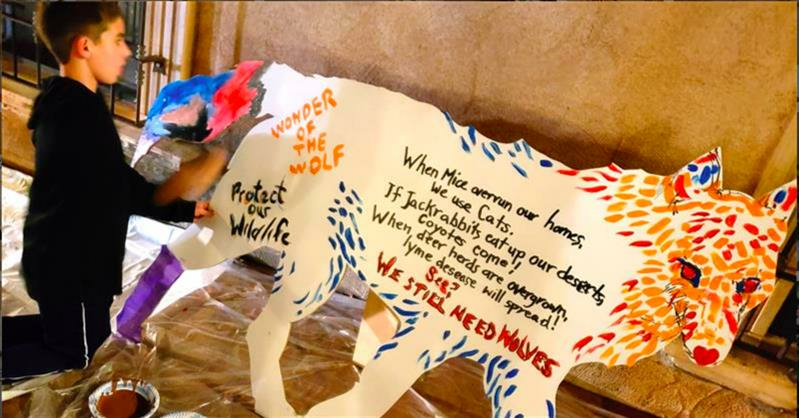 Individuals from the community came to paint, draw and write their messages of support for wolves and all animals as well as the Endangered Species Act. The intention is for this mural to grow and travel throughout the U.S. with its final destination the National Mall of our nation’s Capital. We are honored to have renowned eco-political artist Lauren Strohacker collaborating on this project. 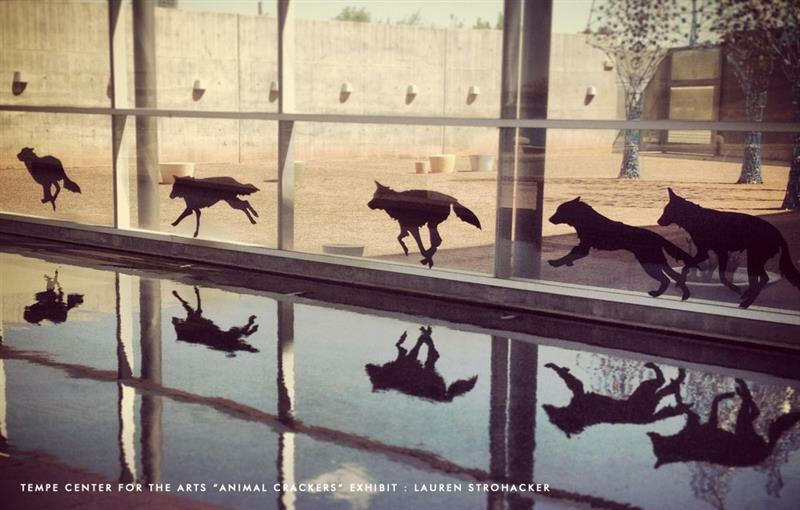 The silhouettes of the “wolves” will act as the canvas for the Call of the Wild Mural will be created by Lauren. Wolf silhouettes will serve as “panels” to the mural and will be added as it travels, growing into a meaningful, impactful expression of humanity’s need to reconnect to nature. The wolf silhouette was chosen in recognition of it’s unique relationship to man, which is well documented. It is widely acknowledged that humans and wolves developed a close relationship after recognizing themselves in each other while hunting on the trail of big game. Many scientists believe that wolves initiated the relationship, even teaching man how to hunt ensuring their survival. Howling is the call of the wild for wolves and it is more than communication, it strengthens the social bonds among pack members. It’s been said the pack that howls together stays together. Join the pack and be a part of this ground-breaking public art project. “Howl” with us by adding your voice to the mural. All are invited to contribute, whether in words or images to this organic collaborative traveling piece. Art has the power to open hearts and minds, creating space for new understanding and vision. Following the tradition of other collaborative public art installations such as the Aids Quilt and the International Children’s Peace Mural Project Kids Guernica The Call of the Wild Mural celebrates the power of the pack, the strength of our collective voices working to shift the paradigm from a position of us vs them to one of co-existence. In order for the vision of the mural to come to life, we need your financial contribution. Sponsors would be recognized in media, press releases, advertising, on-site materials, on-site announcements, social media, websites and more. Believe in art for advocacy? Sponsorships for the traveling art installation available here. Wolves are an apex predator, the top of the food chain with no natural predators. Scientists say their survival, along with other apex predators, is critical to every other species. They are central to the functioning of ecosystems, the regulation of disease, and the maintenance of biodiversity. Let an apex predator die, conservationists say, and you endanger the whole system. In the past 40 years, the Earth has lost more than half of its wildlife. We are part of that system. Essentially, when we save wolves we save ourselves. Her work emphasizes the non-human in an increasingly human-centric world. Born in Ohio in 1983, she received a BFA (2006) from The Ohio State University and an MFA (2011) from Arizona State University. This nonpartisan Act is supported by the majority of Americans yet is in danger of being weakened. The purpose of the event and the traveling mural is to visually demonstrate the public support of the ESA. Share the powerful impact that wildlife and the environment have had your life. Join the nation and save those that need to be saved.